I've been looking for a blanket that fits my mattress. I like a blanket I can tuck in and this is the one! I finally found what I was looking for!! Madison Park brings you a Premium Oversized Hypoallergenic Down Alternative Blanket with 3M Scotchgard treatment. The 3M treatment repels stains, keeping your blanket looking newer longer. 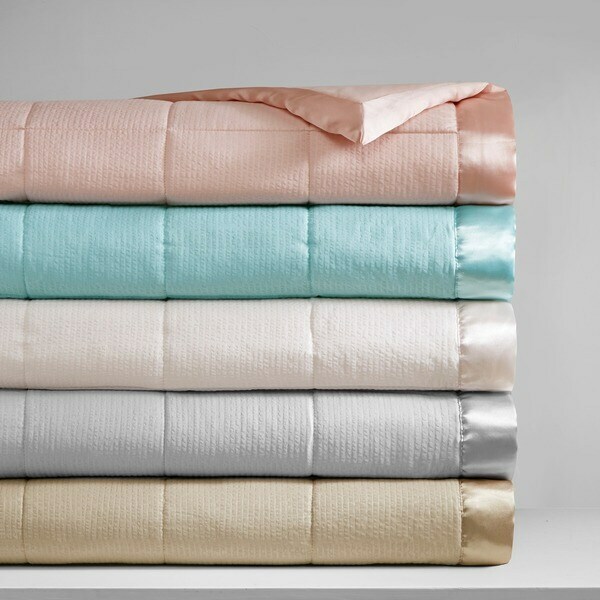 The blanket features end to end box quilting to prevent the fill from shifting, providing an even distribution of warmth. This blanket is like the down stuffed squares you see everywhere for a lot of money...except the squares are not stuffed. It’s a very thinly stuffed blanket. But I’m good with that! It makes for a very lightweight blanket and still has some warmth to it. Buy it for mid seasons or with use of another blanket. Just don’t expect it to be your winter answer alone. Each side has a different fabric so I like the versatility. The best part I was thrilled about is it’s size! It’s truly oversized making it fit either direction so you can have plenty to tuck in the foot of the bed or you can have plenty to cover each side if you need that for a blanket hog. I absolutely love this blanket. I'm only giving it 5 stars because the blanket is not really a soft blanket. If you are looking for a soft, snuggly blanket, maybe you wouldn't like this isn't for you. However, this is a great blanket, is well worth the money. This blanket is the middle blanket on my bed. My husband and I end up fighting over it...it's somewhat "perfect" for a warm night. Love this blanket! Exactly what I wanted! Looks more expensive, feels great. Goes great with my Madison Park quilt. I have a Cal King bed and have trouble finding blankets. King size are too long and not wide enough. This one is oversized and PERFECT. This is one of the nicest blankets ever. I use it on the bed during the summer rather than the big heavy comforter that I put on the bed for the cooler months. It is light weight and looks great. I highly recommend this to anyone looking for a pretty blanket. I use it with a bed skirt and decorative pillows and it looks so nice. Oversized blankets are so hard to find and this one is the perfect size for a king bed. It is super soft and not too heavy but still keeps you comfortable. We live in the South and this is a fabulous year round blanket. I had to order another one in a different color. This is a really nice blanket! It launders well... I have had other blankets that did strange things after being washed (batting that bunched up or came out through the fabric), but this one washes nicely with no issues! I like the "oversizing" on this blanket as it does cover the sides of my mattress in the overhang, some blankets do not. The satin edging gives it a nice finish, and one side of the blanket has a bit of a slight rippled texture or a lined texture, while the other side is smooth. I have the gray, and it is a true gray, but very light in color. The only request I would have on this is to have more colors, and some deeper, more saturated colors from which to choose! This blanket was a replacement for my teenager's bed who had something similar in the past. After one night of using his new blanket, he was sure to tell me how comfortable it was and how he slept so well with it! The lightweight material is perfect for all year round and is very soft to the touch with a soft, satin trim. I love that there are several inches that hang on each side of the bed as well. This purchase was a perfect choice! This blanket was purchased as a gift so I will not have the opportunity to use it personally, but I'm considering ordering one for myself after only a quick inspection upon delivery. The microfiber fabric is soft and luxurious to the touch, as is the satin binding. It seems an ideal weight for year round use. I chose the blanket in gray and the color appears to be just as pictured online. This is my second Madison Park Parkman Premium Oversized Down Alternative blanket I’ve purchased. I ordered this one as a gift for my friend who just bought a new bed. She loves it and I was happy to give her something she can use everyday. I finally found a blanket wide enough that my husband and I don’t have to each struggle to keep covered during the night. We have a regular-sized king bed so this oversized blanket is perfect. The weight is good for us. I just wish there were more color options. I bought three in different colors and think all of them are very pretty and soft. They're snugly but not too heavy and fit well on my beds. I would purchase again. Colors are to to the pictures. They're not as heavy or high quality as the higher priced real down comforters, but good quality for the price! Lightweight, soft and easy to care for. I just purchased my second one for back up. I have washed it over and over and it has held up nicely so seems to be good quality. Would recommend to anyone, nice blanket. So comfortable. I bought this as a blanket to go under my comforter, so I could roll the comforter back at night but still have a blanket. The fabric lets you stay cool during the night but gives you the weight of a blanket to keep you comfortable. Would recommend. Plus I had a hard time finding this type of blanket in any store this time of year, but found it here. Very lightweight and soft. Perfect for the summer or beach. Love these blankets. Light weight yet very warm and beautiful too! Totally love this blanket. It could be used as a comforter but I like it under a lightweight quilt. It provides lots of warmth without the weight. It is very large and I don't worry about it sliding off the bed leaving a cold spot. Those who sleep with a cover hog will understand. It is big enough o hang off the sides and tuck into the foot of my kingsized bed. Planning to purchase one for each bed in my house. Good size, good weight, however kinda shiny and plastic feeling. (Maybe from the scotchgard) Not super soft or sheet like. Hoping after a time in the wash it will soften up some. I got the gray and pink. The gray almost looked like a tarp. Thought about returning them but daughters wanted to keep them. They are growing on us. I love this blanket! It is oversized, which is great. It tucks in nicely on my king size bed. I was looking for a blanket to replace the one I lost in a fire. This is as close as it gets. It’s light, not bulky, but it is warm. It will be perfect for spring & summer. We have a regular down comforter when we need it. This is not a heavy blanket that you would use by itself in winter. We both love this blanket! Beautiful blanket! The pink is a soft blush and matches my bedding perfectly. I also bought the king size for my 17” deep mattress and it is a perfect fit. Of all the blankets I’ve owned this is my favorite. Very nice blanket, warm & comfy, wanted a blanket that would not be to heavy and still could use in spring for chilly nights! Also good quality and nice fabric, I would recommend it for someone looking for a nice blanket! I like the fact that as long as I have had this Blanket it still looks and feels like brand new. We have had to use it as a carry-all and yet when washed it looks like we just got it. It is very warm so we only need a sheet with it. Best blanket I have ever own!!! Hasn't gotten out of shape which is a plus in my book. Love the size of this ,I bought the queen for my queen bed but have it turned so that the sides are longer and there is still enough to tuck the bottom corners in .The weight is perfect for Fl. with the air on and fan going , it’s warm enough but not to warm, I have not had to flip it off of me during the night like all other blankets. I only have a top sheet under it . I did buy another one for when we go up north for the summer. It’s a lot cooler up there but I feel like it’s still a good weight if we have the heat going . I bought the ivory and taupe . The picture of the taupe isn’t great and I was leary that it would be to gold but it’s a really nice rich taupe . Haven’t washed either yet so can’t say anything about that .I was concerned that the scotchguard would feel stiff but the blanket is soft . I also like the option to use either the smooth side or the textured side up. The textured side reminds me of seersucker fabric which I love ! Great light blanket for bed. It’s soft and is light enough for Texas summers. Good quality material for price. Really soft material. Its light enough so you don’t get too warm. But also does a good job at keeping you warm in winter weather. "Hi~ Regarding the surface texture, another ?/answer said textured & untextured micro fabric.... I'd like to know if it's a "slippery/slick, smooth" feel or slightly "rough" texture? I find myself having to strategically layer my blankets so they're not sliding off each other & the bed as hubby is a restless sleeper. Thanks so much!" "Is the blush color more pink or peach?" I'm not going to be too much help here, but I thought I would offer you some input...I purchased the aqua blanket. There is almost no difference in the picture versus the color of actual blanket. And I absolutely love this blanket- get this on sale, buy a couple, it is a must have! Good luck! "What are the different type of fabrics on each side of alternative down blanket ... and is this blanket hypoallergenic?" Material details: Face: Solid embossed micro fiber with 3m scotch guard repel and release treatment, 100% polyester. Reverse: Solid micro fiber with 3M scotch guard repel and release treatment,100% polyester 3" binding: 100% polyester satin. Filling: 100% polyester fiber,end to end box quilting. "How many ounces of fill in the twin blanket?" I have no idea what the ounces of fill are in our blanket. We do love the blanket, fits good and washes up very nice..would buy it again. "Is this blanket too big for a cal king bed? " No ' It's just right ! Fits very nice on a king bed. Since the Cal King is longer, there will not be as much to tuck in the bottom. But I think it is still adequate. "What is the weight of the Queen size blanket?" It weighs approximately 4 lbs. It's very lightweight and has a nice textured side to it on one side. I live in Arizona and we've had extremely hot temperatures this summer so we have to keep the A/C going all the time. This blanket is perfect. Not too heavy, just a light covering over the sheets. "Is this blanket good for the occasional cool summer night in new england? Don't want anything too hot." I live in Texas, and this blanket is fluffy and lightweight but still warm. I keep it on my bed even in warm weather because it's just the right amount of warmth when we use air conditioning and turn the thermostat down. I think it would work very well for the use you described. I agree. We LOVE this blanket in all seasons. Although I live in TN now, I am from MA, and yes I would definitely think this blanket would be ideal for that area. I would use it up there if I still lived there. Here in TN I keep it on the bed until October.